Actor Dennis Haysbert is best known for playing president David Palmer on the Emmy- winning action series "24", but he also has a flourishing film career. His latest film is a tale of racial and sexual morals in 1950s suburbia entitled "Far From Heaven". Inspired by the great Hollywood dramas of the era, the film tells the story of the Whitakers, whose daily existence is characterized by carefully observed etiquette, social events and desire to keep up with the Joneses. Cathy Whitaker (Julianne Moore) is the housewife, Frank Whitaker (Dennis Quaid) is the breadwinner husband, and Raymond Deagan (Dennis Haysbert) is the widower gardener. "He comes across Cathy and he just wanted to be a friend, he had purely innocent intentions. He just wanted to be a shoulder to lean on. 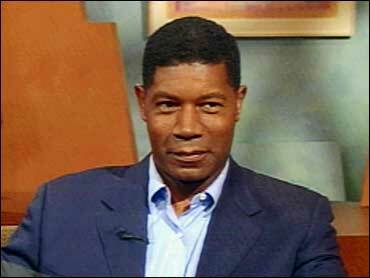 I love the way the relationship got started," says Haysbert about his role. As the story unfolds, boundaries of sexual and racial tolerance are broken. Cathy finds out her husband is gay and her relationship with Raymond starts to evolve to something less innocent, but is frowned upon due to the difference in race. Written and directed by Todd Haynes, "Far From Heaven" opens in New York and Los Angeles this Friday. Born in San Mateo, Calif., June 2, 1954. Attended American Academy of Dramatic Arts in Pasadena, Calif., and majored in acting. 1981-1982: Cast as regular on ABC drama series "Code Red"
1990: Acted in the adventure drama "Navy SEALs"
1992: Featured in the sports comedy "Mr. Baseball"
1993: Played supporting roles in two CBS miniseries, "Queen" and "Return to Lonesome Dove"
1995: Featured in "Heat" and "Waiting to Exhale"
1997: Acted in the political suspense yarn "Absolute Power"
1999: Had a supporting role as a police detective in the virtual reality thriller "The Thirteenth Floor"; also acted in Hampton Fancher's unconventional serial killer drama "The Minus Man" and was featured in the romantic drama "Random Hearts"
1999-2000: Co-starred in the CBS drama series "Now and Again"
2000: Played unfaithful husbands successful in their high-profile careers in the independent features "Love & Basketball" and "What's Cooking?" 2001: Had recurring role on the Showtime drama "Soul Food"
2001: Cast as a U.S. presidential candidate targeted for assassination in the fall Fox drama "24"